I just bought a 2013 LX, and the dealer told me that there is no radio security code required for this model. Can anyone confirm this? OK, since no one seems to know, let me try a different approach... You recent 2013 LX buyers out there- when you took delivery, did you get the little card with the radio serial number or the security code printed on it? I did not, and when I called about it, was told the card wasn't needed for this model, as a security code for the radio that comes with the LX (non navigation) was not needed. So the clue is this little card. If you did get such a card with your new car, then the dealer was giving me a line of B.S. Please let me know if I need to push the issue with the dealer. Thanks. I have a new 2013 Touring and did not receive any card or sticker or anything with the codes for the navigation or radio. I called my dealer and he was supposed to get back to me but that was a couple of weeks ago and I haven't heard anything. Well, Jerry, good to know I am not the only one out here with this issue. SOMEBODY must know the answer! I found this thread on another web site. Accord EX-L ant Navi anti-theft radio / navigation code(s) - Drive Accord Honda Forums Take a look at posting number 13 way down the page. Thread is confusing, and I am still holding out hope for a GOOD answer! 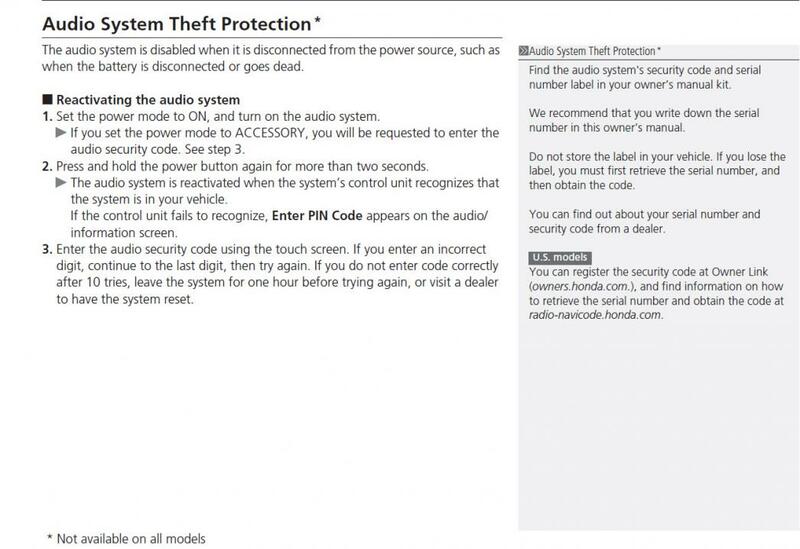 I have perused the Hondalinks previously and in order to get the radio and navigation codes you have to provide the vin, phone and zip, and the device serial number. It also tells you that the serial number is on the card with the code! Now if you don't have the card, you don't have the serial number. I have looked in my booklets that come with the car and in the section where the preparation technician is supposed to write in the serial and code nothing has been entered. The owner's manual says that you have to have the codes to re-activate the devices if they lose power at some point. It also says to check radio-navicode.honda.com which says the same thing as Hondalinks. I guess since my dealer never got back to me I'll have to address the issue directly to Honda somehow. I found my codes and here is how I did it. Press the "settings" button, select "system settings" from the menu, select "system device information". The device number is the 13 character alpha/numeric. Go into Hondalinks, sign in and select the "Get device codes" option. You put in the Vin, zip code, phone number, email address and the 13 character device. You need to answer 2 to the number of devices you have. It will give you two codes, one is 5 digits and the other is 4. I believe the 5 digit number is the radio code and the 4 is the navigation. For the 2013 Accords, certain models need the security code; so, it seems the Touring model has the anti-theft code. So, it would appear my "bare bones" LX does not need the code. I had previously seen Jerry's solution elsewhere, but when I tried it, no "system device information" menu item was there to select. Sure would like to verify I really don't need a code for my car. I drive a 2013 EX and I too did not receive the radio's serial number with the car and also I did not receive the key/fob number tag (not even sure if the fob comes with a number tag or not, it is not clear in the manual) and the fact that I didn't receive it and I have to chase the dealer for that **** me off. Also, I just verified that I also don't have a system device information in the EX. Were you able to to find a reliable answer to your question since April? Quick Reply: 2013 LX Radio Code Not Needed?